Proprietary "Audio Noise Free OCP Compensation"
SF5565M is a high performance, high efficiency, highly integrated current mode PWM controller for offline flyback converter applications. In SF5565M, PWM switching frequency with shuffling is fixed to 65KHz and is trimmed to tight range. When the output power demands decrease, the IC decreases switching frequency based on the proprietaryη-BalanceTM control to boost power conversion efficiency at the light load. When output power falls below a given value, the IC enters into burst mode and can achieve less than 100mW no load power. The IC can achieve "Zero OCP/OPP Recovery Gap" using SiFirst's proprietary control algorithm. SF5565M also has built in proprietary "Audio Noise Free OCP Compensation", which can achieve constant power limiting and can achieve audio noise operation at heavy loading when line input is around 90VAC. 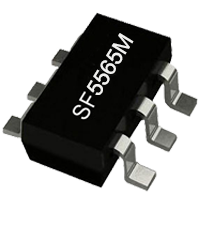 SF5565M integrates functions and protections of Brownout Protection (BOP), Under Voltage Lockout (UVLO), VDD Over Voltage Protection (OVP), Cycle-by-cycle Current Limiting (OCP), Over Load Protection (OLP), Gate Clamping, VDD Clamping, Leading Edge Blanking (LEB), Soft Start, Pins Floating Protection, etc. In SF5565M, VDD OVP is latch plug-off protection, the other protections are auto-recovery mode. SF5565M is available in SOT23-6 package.